This article by Robert Wright features the harsh continued debate over the construction of a mosque near ground zero. The debate is filled with intolerance, fears of radicalism, and biased players; the attacks on Imam Feisal Abdul Rauf are especially disheartening and the opposition of some NY politicians are incredibly disappointing. Computational neuroscientist Sebastian Seung gave a fascinating talk at Poptech about “connectomics” – how our brain is wired and connected, and how our experiences shape our brains, and influence our personalities and behavior. Super interesting stuff. This fascinating article breaks down what goes on in your brain during exercise. According to studies, exercise increases Noggin, a protein that facilitates neurogenesis, the production of brain cells. This proves again that there are manifold benefits to adopting healthy habits! David Brooks observes in a recent column that our society is increasingly obsessed with self-branding and self-aggrandizement – at the expense of humility and introspection. In their book, “The Narcissism Epidemic,” Jean M. Twenge and W. Keith Campbell cite data to suggest that at least since the 1970s, we have suffered from national self-esteem inflation. They cite my favorite piece of sociological data: In 1950, thousands of teenagers were asked if they considered themselves an “important person.” Twelve percent said yes. In the late 1980s, another few thousand were asked. This time, 80 percent of girls and 77 percent of boys said yes. That doesn’t make them narcissists in the Gibson mold, but it does suggest that we’ve entered an era where self-branding is on the ascent and the culture of self-effacement is on the decline. Those who retain the ability to self-evaluate will fare better. KIND in the New York Times! Thanks to a great article by Stuart Elliot, KIND gained New York Time’s fame yesterday. Check it out to learn more about the KIND movement, our unique business model, and Daniel’s unbounded energy to surprise complete strangers with random acts of KINDness! This great article in ReadWriteStart features a story about Startup Weekend, a Seattle based team of developers, marketers, and managers looking to facilitate startup launches, who recently partnered with the Peres Center for Peace (PC4P). The goal? To enable Palestinians and Israelis to collaborate on projects that both produce valuable items and build bridges. The Startup Weekend philosophy echoes the PeaceWorks belief that populations in conflict regions can cooperate in business endeavors and eventually build something much greater than the good or service they produce. Further to this post by Adeena regarding the rising attacks against the Mosque being erected in downtown NYC, let me provide some more background to the thousands of people that are attacking this project without taking the time to do a little bit of research about it. I received this video post by Pat Condell from my sister, attacking the project. The mosque near Ground Zero is being opened by a dear friend and member of the PeaceWorks Foundation’s Honorary Board, and a remarkable human being who our Dad would have loved as much as he loved Rabbi Scheinberg [our Orthodox Rabbi in San Antonio, TX, who we all admire for his deep humility, warmth, and respect of others]. He is a humanist and a pluralist, a tolerant sweet man, and the role model of what we should want EVERY religious leader – Muslim or otherwise – to be like. Please forward back to Oren and anyone else who shared this with you. To briefly expound on this note, let me respond to some of the assertions made by Mr. Condell. He attacks the religion of Islam as an ocean of hatred, violence and intolerance. But intolerance and hatred are sadly not exclusive to Islam. All major religions have their regrettable elements of excess. Incidentally just a couple days ago I saw a fantastic movie – Goya’s Ghosts – starring another PeaceWorks Foundation Honorary Board member, Natalie Portman, as a woman who is jailed, raped, and oppressed by the Spanish Inquisition. There is no question that there are monstrous people who I call "pseudo-Islamic terrorists" who usurp a religion that can be about love and respect, and hijack it to advocate extremism and hatred. But they do not represent the Islam that many of my friends follow, a religion of humility and striving to be better human beings. The real challenge is who is going to win – the tolerant and progressive leaders of Islam, or the regressive ones? It is up to us to uphold the tolerant and enlightened and respectful leaders who dedicate their lives to peace – as is the case with Imam Feisal Abdul Rauf. Demonizing and isolating and chastising them is not a way to strengthen the moderate voices within Islamic countries!!! Pat Condell writes about how Islam divides people into us vs. them, but he seems to miss the irony in that this is precisely what he does in his video posting by trying to portray all of Islam as intolerant. It is true that diversity and tolerance are critical to a functioning democracy. But sermons like the one by Pat Condell are just as offensive to this notion as intolerant Muslims. Contrast that to Imam Feisal Abdul Rauf. Mr. Condell clearly has never met him. But more disturbing, he hasn’t even taken the time to research the Cordoba Initiative. The initiative was conceived by Imam Feisal almost a decade ago to celebrate the CO-EXISTENCE and DIVERSITY that characterized Cordoba during its golden age. Condell claims that the Cordoba Initiative was named that way to emphasize the conquest of Christianity by Islam. He should have started by doing some research! Imam Feisal Abdul Rauf, a OneVoice board member has become the subject of accusation in a fierce debate about constructing a proposed mosque nearby to Ground Zero that he is actively spearheading. Opponents feel that building a mosque in close proximity to the location of the 9/11 attacks would be disrespectful or even threatening. The Daily News, Wall Street Journal and New York Magazine and other news sources all feature articles depicting the criticisms that come from a population that is otherwise known as one of the most tolerant around the world. Republican gubernatorial candidate Rick Lazio challenged his Democratic opponent Wednesday to explore the legality of the funding behind a proposed mosque near Ground Zero. "New Yorkers have a right to feel safe and be safe," Lazio told reporters in lower Manhattan. "There are serious security questions about the appropriateness of this mosque." Lazio demanded Attorney General Andrew Cuomo figure out where the backers of the Cordoba House expect to get $100 million to build it. "Anyone who has evidence of wrongdoing should send it to us, and we will review it," Cuomo replied in a statement. In a letter he sent to Cuomo, Lazio cited press accounts that Imam Feisal Abdul Rauf, who’s spearheading the mosque’s construction, is a "key figure" in an organization that funded the flotilla that sought to break Israel‘s Gazablockade. Debra Burlingame, whose brother Charles was a pilot on the plane terrorists crashed into the Pentagon on 9/11, said the imam has written about his hopes of bringing strict Islamic law to the United States. "He means to use the Ground Zero location of the mosque to ‘leverage’ people to Islam," said Burlingame, the co-founder of 9/11 Families for a Safe and Strong America. Organizers behind Cordoba House have said they have peaceful intentions and the mosque is just one part of a larger community center that will be open to everyone. 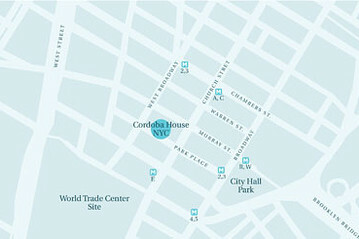 The center would be located on Park Place, about two blocks from the World Trade Center site. More than 50% of New York City voters oppose a plan by a Muslim group to build a mosque and cultural center just blocks away from Ground Zero, according to a poll released Thursday by Quinnipiac University. “New York enjoys a reputation as one of the most tolerant places in America, but…opponents suggest that the mosque would dishonor the memory of the [9/11] attack’s victims,” said Maurice Carroll, the director of the Quinnipiac University Polling Institute. According to the poll, 52% of New Yorkers oppose the plan to build the mosque and cultural center, known as the Cordoba House, compared to 31% who are in favor of it and 17% who are undecided. The poll of more than 1,000 registered voters across the city found that support for the $100 million project appeared to be strongest in Manhattan, where 46% of poll respondents said they were in favor of it, compared to 36% who said they were opposed. Elsewhere across the five boroughs, the project appears to face staunch opposition, especially in Staten Island and Brooklyn, where as The Journal’s Sumathi Reddy reports, local chapters of the Muslim American Society want to build mosques in Sheepshead Bay and Midland Beach. In Staten Island 73% of respondents said they were against the Cordoba House proposal, compared to 14% who said they supported it. In Brooklyn and the Bronx, 57% of respondents said they opposed the mosque and cultural center, while in Queens opposition stood at 52%. The poll found that whites, Hispanics, Jews and Catholics appeared to be more likely to be opposed to bringing the mosque and cultural center near Ground Zero. Blacks and protestants– while still largely against the plan–revealed more divided opinions, the poll reported. Despite the opposition, 44% of New Yorkers said they had a generally favorable opinion of Islam, compared to 28% who have an unfavorable view of the religion and 28% who didn’t know. A majority of those indicating favorable opinions tended to support the plan for Cordoba House, the poll reported, while those with an unfavorable opinion of Islam were almost unanimously against it. In May, the project, which is being spearheaded by the American Society for Muslim Advancement, received the support of Lower Manhattan’s Community Board 1. Yet as Metropolis previously reported, board officials said they only voted on the proposal for the cultural center, not the mosque, which has generated some controversy. Objections aside, the biggest obstacle to the 13-story project appears to be history. Later this month, the Landmarks Preservation Commission will decide whether the building currently on the site is architecturally significant enough to merit protected status. That in and of itself would not derail the mosque and cultural center, but it will make it unlikely that the building could be demolished to build the proposed projects. Republican gubernatorial candidate Rick Lazio, languishing far behind Democratic front-runner Andrew Cuomo, needs something to shake up the race. How about anti-Islamic sentiment? Yes, that will do. A few days after a poll showed that a majority of New Yorkers oppose the building of a mosque and community center two blocks from ground zero, Lazio has released a letter calling on Cuomo (who supports the mosque) as attorney general to investigate certain issues the media has raised about the mosque’s leader, including his refusal to label Hamas a terrorist organization and his membership in an organization that donated money to the Palestinian aid flotillas — neither of which are illegal, but sure, why not?